France is a pretty big country and there are many different areas to explore but you don’t need to drive for miles to see some of the very best of them. The France Motorhome Hire depot is based in one of the most beautiful French regions of all, Burgundy. The wine marketing board have published a wine tourism route for our most local Burgundy department of Yonne and following it would make for an excellent one week motorhome tour with many interesting highlights from ancient abbeys to the prettiest of medieval villages. Driving between historical treasures is a delight here too with vine clad, rolling hills and the Rivers Yonne and Nivernais providing some wonderful views as you navigate through the region. Last week we talked about one of our favourite campsites at Joigny and this is where we suggest you start your Yonne trail. Beyond that you can simply create your own route based on what you like to do. Your trip can have a wine theme, a historic buildings theme, a pretty village theme, a great outdoors theme or a combination of all of those. – Spend your first night in the riverside town of Joigny, it has everything you need to stock up on provisions, eat and out and spend a comfortable night on a lovely campsite. 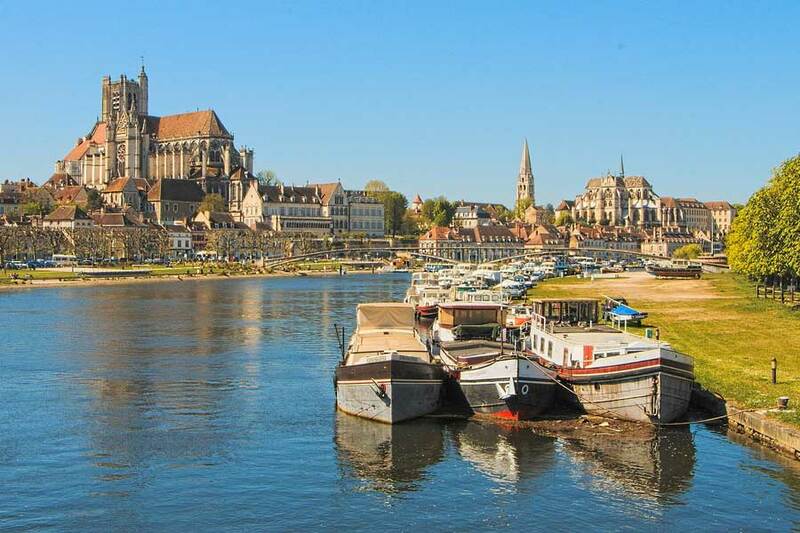 – The town of Auxerre (also on The River Yonne) has a free overnight halt for campervans, right next to the river and town. Don’t miss the Saint-Etienne Cathedral and the Abbey of Saint-Germain with its Carolingian crypts. 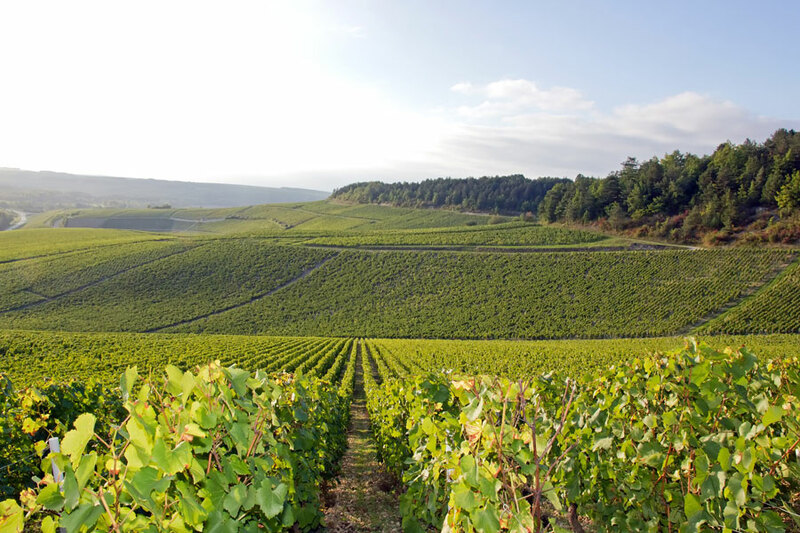 – The Chablis wine region is home to some of the prettiest villages in the area and Chablis town is a lively, pretty spot with many opportunities to taste wine and multiple historic buildings. 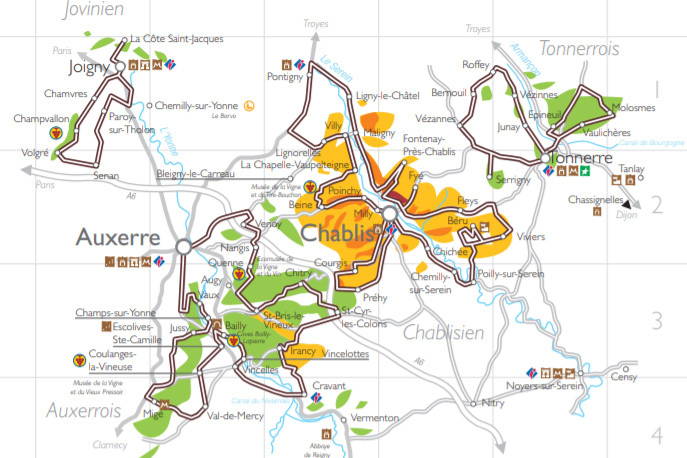 Chablis also has both a campsite and a free overnight halt a short walk from the town centre. – Our local vineyards are famous for their white wines be there are a couple of relatively unknown appellations that produce sublime reds too from pinot noir. To taste the best local reds, head to Coulanges-les-Vineuse, Irancy and Epineuil. The vineyards are flanked by pretty villages and countryside with lots of places to spend the night and taste wine. The best red wines are as good as their famous neighbours further south in The Cote d’Or but half the price. – Drive along the Nivernais River and Canal for wonderful scenery, pretty villages and lots of wine tasting opportunities. You can swim in the crystal waters of the river too and there are plenty of campsites and places to spend the night. – The hilltop village of Vezelay with it’s glorious Basillica and Medieval village of Noyers-sur-Serein are well worth a visit. Both are classified as “Plus Beaux Villages de France” (ranked in the 155 most beautiful villages of France). – Finally, Tonnerre is worth a quick visit to see The Fosse Dionne (a historic and strangely wonderful water source tucked up a side street in the town) and the hilltop church. If you happen to go on a Saturday or Wednesday morning, the covered market is a must see. You can read more about the Yonne Wine Tourism Trail here. If you only have a week for your trip, don’t spend it driving from one side of France to the other to find far flung highlights, the most wonderful sights are all around us and very close together. Spend your days making short, interesting drives between the stunning sights of the Yonne region instead of trying to cover great distances. It will save you loads of money in fuel and road tolls too!